So some of you may know me as an admin for the SPUFserver. It’s a job that comes with a lot of pain because running a server is very hard work. However, it’s a job that can be quite a bit of fun, knowing that you are the god of the little TF2 universe stuck within that server. One of the interesting things I get to do is pop up on SPUF and offer to host events that are being floated around. I like doing this because events are a fun thing for the community to enjoy, but there’s a lot of work that goes into running them, and I thought I might share a little bit with those of you that might possibly be coming up with (and then proposing to my admin staff) events in the future. Think of an idea.This is easily the hardest part of holding an event – what are you going to do that is so interesting and that people will actually want to be involved in? If you don’t have a good idea, you’re not going to have a good time. Most of the time, people on SPUF come up with the ideas and I simply agree to host them, but I don’t rely on SPUF for creative inspiration all of the time. 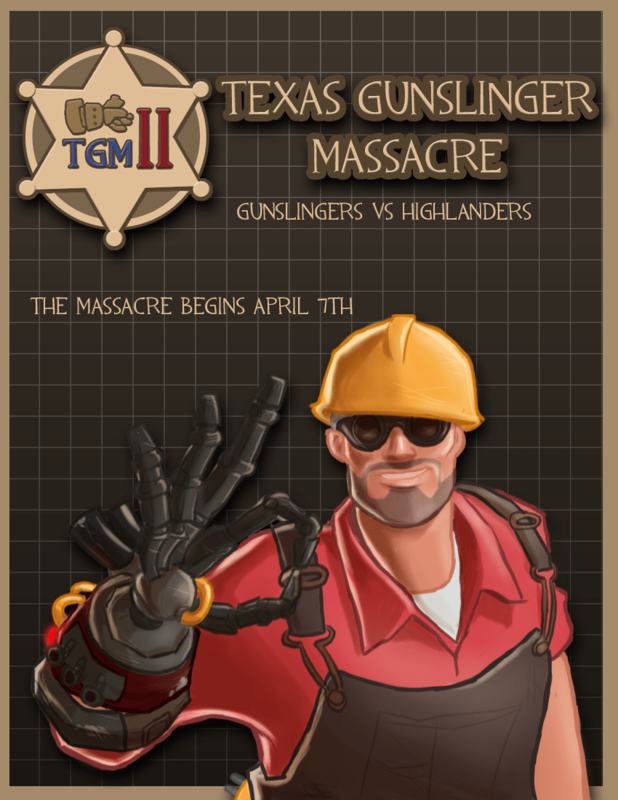 The two notable instances are the eternally popular Texas Gunslinger Massascre (now being held for a third “season”), which was an idea originally drafted by me in the wake of continued protests over the Gunslinger being OP and organized by my trusty sidekick Rammite, and SPUF vs. SCUD (which just completed a rematch recently, as covered by this blog), which was originally created by my other trusty sidekick binary. Organize a time and place.Most events are just that – events – and if you want somebody to participate you’ve got to have an idea of where and when they’ll be duking it out for fame and glory. For a diverse community such as SPUF – one that spans two continents over a vast ocean – you generally have trouble arranging a good time where everyone can participate (and usually have a very small window in which to participate). Latency issues are also a major problem… no matter where you put the server, someone’s probably complain about how they have horrible lag. The events on SPUF are almost held on weekends during GMT evening (US afternoon or morning) and using an East Coast server (which the SPUFserver conveniently is) for those reasons. Advertise.What good is a time and place if nobody’s going to be there? You need to make sure that people know that not only a) you have an event going but also b) you want their help and support in making the event successful. Generally, rallying support for an event is not that difficult, especially for a vibrant community like SPUF where if it looks interesting, people will sign up for it. However, if you want your event to have broader appeal, want an audience to actually care about your event, and/or aren’t quite well known for hosting events, be prepared to spend a lot of time promoting it. Time is the greatest asset you can have when it comes to advertising. Promoting events becomes easy when you’ve got a community to support you, like the awesome artist Vain Glory helping out with a Texas Gunslinger Massacre Season 2 poster. Coordinate the actual event.You have all of the elements of running a great event… but I feel like we’re missing something. Oh! Right! The event! Reflect, move on, and prepare.Even after it’s over, it’s not really over. There’s a lot you’ve still got left unfinished. Once you’re done with congratulating and thanking everybody and participating in any post-event festivities there may be, it’s time to clean up the house, so to speak. The one best thing you can do is take the time to learn from the experience. What went well? What failed miserably? What could you have done better? What do you need help with doing? How do you make the next event better? Once you’ve done that, you’re finally allowed to take a nice break… but don’t wait too long to begin working up your new idea or looking into how to do a repeat better. I hope this little overview (heh) helps you to understand how you should effectively plan an event. If you’ve got any questions as to the process, you can always ask me, and I’d be glad to help you. Thanks, and have fun!